Medicare can feel overwhelming. First, you get tons of mail and it’s hard to discern what’s junk and what’s not. Then, you start researching and realize there’s a ton of parts and plans and letters… what does all of this really mean? You’re not alone – everyone feels this way when they first become eligible for Medicare. Whether Medicare is 5 years away and you’re just beginning some research or it’s time to sign up now, our experienced team of local, licensed agents can help. If you’re new to Medicare and are retiring or are already retired, Medicare will be your new primary insurance at age 65. In fact, most individuals will sign up for Medicare around their 65th birthday. In order to get started with Medicare, there are a few steps to take. Step 1: Learn how Medicare works. Medicare has several parts that are organized by letters A, B, C, and D. Learn more by clicking the Parts of Medicare link below. 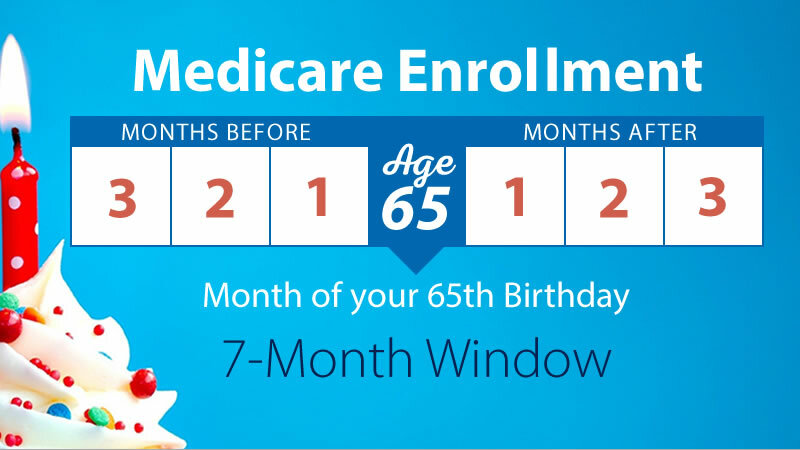 Step 2: Determine when you’re eligible to sign up for Medicare. Your monthly premium for Medicare Part B will go up 10% for every 12-month period that you could’ve been on Medicare and chose not to sign up. For example, if you wait 2 full years, your penalty is a 20% markup on the Part B premium. Remember: this doesn’t apply if you have health insurance already. Step 3: Choose what coverage you want. Most people will enroll in Medicare Part A no matter what, because it’s free to have if you’ve worked and paid Medicare taxes for at least 40 quarters. If you’re still working and have health insurance, you might decide to delay getting Medicare Part B. There are also Medicare MSAs, a type of Medicare Advantage Plan, that come with a funded savings account you can use for medical expenses ($0 premium). If you choose Original Medicare, we recommend adding a Medicare Supplement and a Medicare Part D drug plan. To learn more about how these choices compare and what we would recommend for you, fill out this form or call us at 217-423-8000. This is not a one-size-fits-all recommendation, either. We will ask you some questions about your health and risk profile to get a feel for which route matches your wants and needs the best. If you’re still working at age 65 – and nowadays, this is becoming more and more common – you don’t necessarily have to enroll in Medicare. Medicare Part A is free, so there’s no harm in having it. However, when it comes to Medicare Part B, you’ll want to take a look at what it would cost you versus keeping your employer’s insurance. Networks are also something to consider. Often times, the health insurance you currently have while employed will be network-based, whereas Medicare is accepted by about 97% of all doctors. What we can do for you is compare your current plan to what Medicare would be. Sometimes, switching to Medicare with a supplement can save you money, especially when it comes to deductibles, copays, and coinsurance. This isn’t always the case, though, so be sure to give us a call at 217-423-8000 or fill out this form. We understand just how confusing all of this Medicare business can be. For every piece of advice you read online, there’s another article telling you to do the opposite. That’s because no one's needs are exactly the same. Our incredible team of knowledgeable, licensed agents has seen it all and can guide you through what you need to know about Medicare. We’ll be your teachers, advisors, and support system for when you need it the most. Our service doesn’t stop at the sale – we’re always here to assist with questions and claims when they inevitably arise. We’re also located conveniently in our downtown Decatur, IL office. You can schedule appointments at our office, or we can come to your home if that’s not available to you. Plus, our assistance is completely free. You’ll never pay us a dime for help with your insurance needs. Call us at 217-423-8000 to get started today!